Let the sunshine roll into this unique Montana cabin. This is terrific for families and kids alike. This one bedroom cabin has a living room, furnished kitchenette, and sleeping loft that sleeps up to 7 people. Two futons are in the living room for maximum comfort. Enjoy cable and our dvd player inside the cabin. Outdoors, you will fall in the love with the lanscaped yards and groomed gardens that are throughout this property. Spring Creek is a great spring fed creek that you can paddle, swim, or fish in. Take a week to really relax from the city lights and noise and enjoy the quiet whispers of Mother Nature right outside of the town of Kalispell. Kids often love the mini "Western town" that sits on our property and the large playground and floating dock that makes every kid pretend to be "king of the mountain". Adults and kids can play on teams with our on site volleyball net. When weather isn't all that pleasant, partake in a game in the game room or catch up on laundry in our laundry room. We also have a small convienence store on site to help when you forget the small things at home. Kalispell is a wonderful town with loads of things to do when deciding to venture off the resort. Attend some of the nation's biggest and finest events such as the The Event at Rebecca Farm, an equestrian event held every year in the Flathead county between horse and rider. 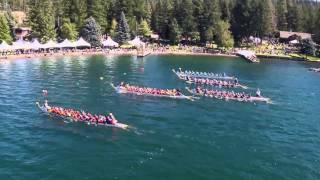 In September enjoy the annual Dragon boat Festival between Canadians and Americans. Other exciting day trips include hiking on some of the 730 miles of Glacier National Park, horseback riding, cycling and even a round or two of golf at one of the championship golf courses in what Golf Digest calls one of the top 50 golf destinations. For family fun, don't miss Woodland Park, a large park with miles of walking trails, skate park, waterslides, lazy river and more. Nearby, there is also Flathead Lake with it's incredible lake clarity, McDonald Lake, diverse ethnic gastronomy options, lazer tag, antique shopping and more. extra person 55.00 per week. Rates do NOT include the 7% Accommodations tax. There is a 2 week notice for a cancelation without a charge for full service cabins. Matt Red Andrews —4 star. Looks very nice, looking forward to go there in August!